The Plug-and-Play modules work with Windows and Linux and they are compatible with the popular Raspberry Pi and Beaglebone computers. For an easy integration a command line tool is provided as well as Java and Python API. 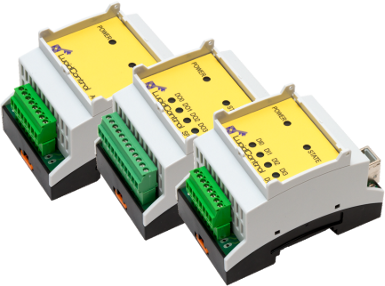 The DO4-S – USB Relay Module is one product of this series and it is able to control 4 Single Pole Double Throw (SPDT) relays. The optical and potential insulated outputs are realized by using solid state relays (SSR). They provide the best overall capabilities for controlling power loads like pumps, fans or heating elements by statically switching or by periodically pulsing. Each output is rated with 30 V and 0.75 A and can switch loads up to 22.5 Watt. 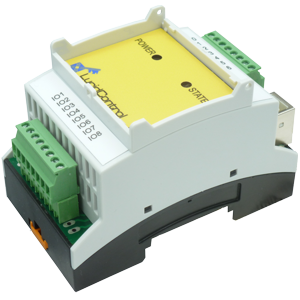 Using mechanical SPDT (C-Type) relay switches allows to switch or toggle signals e.g. for measurements without distortion. This article concentrates on the SPDT Relay Type (DO4-S) of the USB digital io module and shows how it can be used for general purpose applications. Solid State Relays are the best solution for controlling power loads like lamps and pumps. They are able to control the power of a load by switching them on and off very fast using pulse-width modulation (PWM). Solid State Relays have a strong insulation and provide a very strong protection of the controlling computer. In contradiction to the Solid State Relay Module, the USB Relay Module provides mechanical SPDT relay switches instead of semiconductors like transistors. 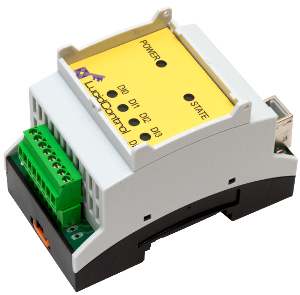 This allows the USB Relay Controller to switch power load like lamps, valves and fans as well as to control signals like temperature sensors or audio lines without distortion. Mechanical relays provide also a very strong protection level to the connected computer because the switched signals are in a completely separate circuit and do not share signals. In the drawing the relay is highlighted gray and the galvanic insulation is indicated by the red line. This protects the control logic of LucidControl USB Digital IO Module and the computer from the switched signal. An additional advantage is that SPDT switches can toggle between two signals. This means it is not only possible to switch a signal on and off but also to select between two signals. Take for example the selection of one out of two audio lines which are alternatively connected to a loud speaker as shown in the picture. 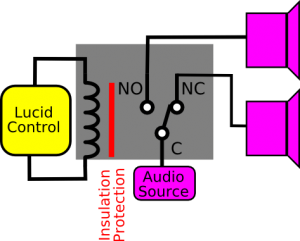 When the relay is switched off, the audio source, which is connected to the common contact “C” of the SPDT relay, is switched to the normally closed contact “NC”. When the relay is switched on “C” is connected with normally open contact “NO”. Like all technical solutions mechanical relays have also their disadvantages. Because of having movable mechanical parts the number of cycles of the switch is limited and it is not possible (or at least not recommended) to switch the relays in a cyclic manor. This means that pulse-width modulation modes are not supported by the DO4-S USB Relay Module. We hope we could give you an overview what you can do with the module. 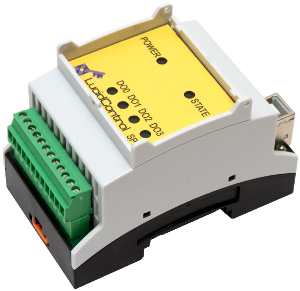 More information can be found on the USB Relay Controller Output Module product page.